This July our freshly baked theme Eat is coming your way and it’s delicious. 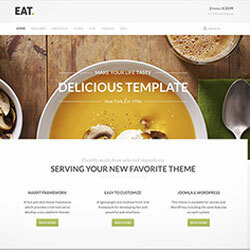 Eat mixes a widescreen teaser image with wrapped content that slightly overlays the header, making this theme’s layout both classy and unique. And if this is not enough, you can use additional positions to publish images inside your content without any margins to the wrapper. Eat is the perfect base for your online shop or to present your café, restaurant or bar. It takes full advantage of UIkit components such as the beautiful switcher, that you can use to filter different content types, like varying product classes. This theme will convince your visitors with its light, clean design, which is topped off with a slick typography and lovely details, for example the notepad-like panel style. Eat also features a bonus style for the Widgetkit Slideshow, perfectly fitting into the theme’s design. Eat is based on Warp 7 and provides full support for LESS. The front-end is completely built with UIkit and can be modified through the Customizer. You can change colors, spacings and fonts without having to write a single line of code. To get you started, Eat already provides 8 different style variations to choose from.